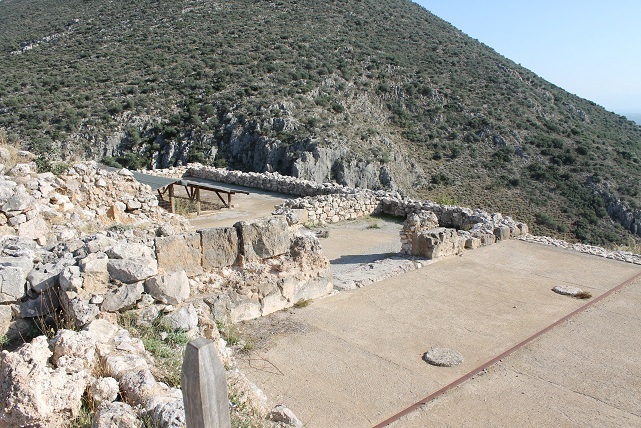 Aigina is an island tucked in between Athens and the Argolid, the region around Argos, where both Epidaurus and Mycenae are located. 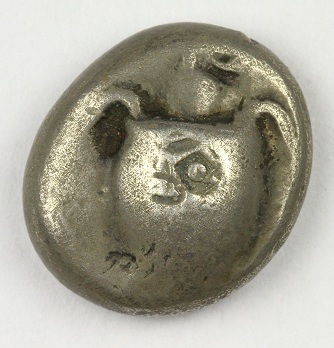 This coin depicts a sea turtle, and was issued in the period immediately before the first Persian attempt to conquer the Greek mainland. I’m actually in Attica! Athens, no less. Places I had heard about since I was a kid mumblety-mumblety years ago are showing up on highway and street signs. Street signs! I grew up on tales of the Greek-Persian wars, the Athenian democracy, and the Athenian thinkers, as well as other Greeks who first began to think about the world in a rational way, all this immersion thanks to reading I did on my own as a kid. And here I am! The people here act like this is normal. Seriously, I have to wonder what it’s like to grow up, aware that that suburb over there (Marathon) is world famous–not just locally–for something that happened 2,500 years ago, or that bluff downtown is so famous that people in college campuses overseas can name all of the buildings on it, and know the names of people who were there, again, 2,500 years ago. That is over ten times as long as the United States has been a country. I live near a fairly famous place, a place known even in Europe (Pikes Peak), but that just doesn’t compare to this. Here the everyday lives of perfectly ordinary people are lived in the setting of legends. 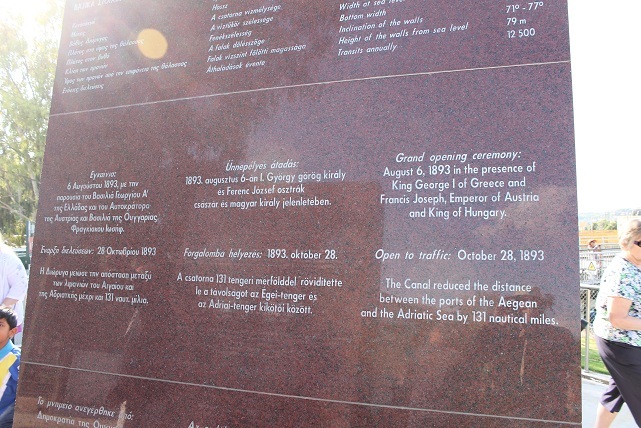 After a night in Athens, I hopped a tour bus, which went west from Athens to its first stop at Corinth. It drove past the island of Salamis, where the Persian fleet met its doom in 480 BCE at the hands of a much smaller Greek fleet, dooming Persian plans to conquer the Greek mainland once and for all. Corinth sits on the narrow isthmus connecting the Peloponnesus with the rest of mainland Greece. In ancient times, it actually made more sense to drag ships over this isthmus than to sail around the Peloponnesus, because the seas immediately to the south were very treacherous indeed. 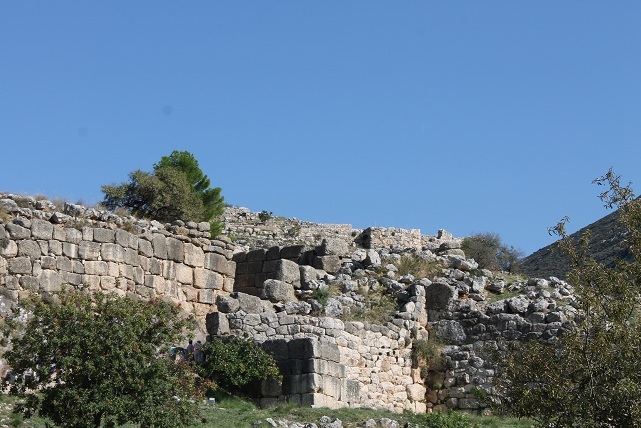 Corinth became quite wealthy due to commanding this route. 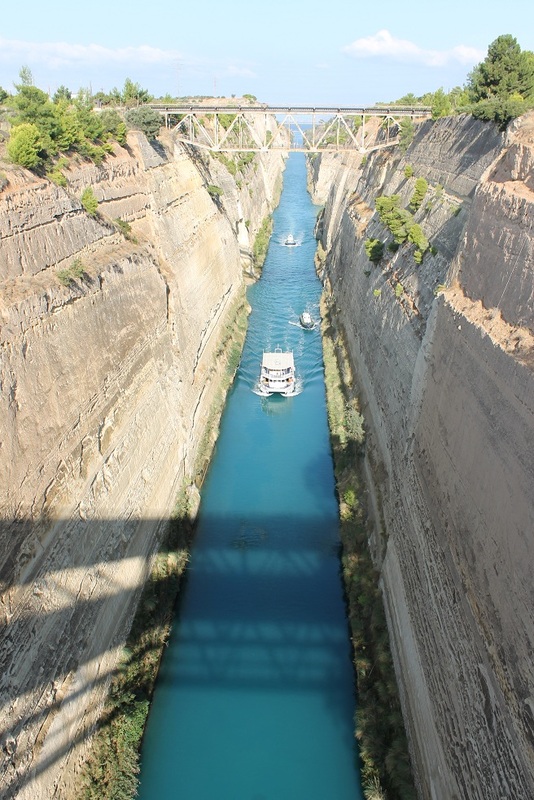 Much more recently (end of the 19th century), a canal was simply cut through the isthmus at sea level, turning the Peloponnesus into an island. Our bus stopped here. When I said “cut through the isthmus” I meant it. It looks like they removed the narrowest slice possible, relying on the rock to retain nearly vertical faces on either side of the canal. 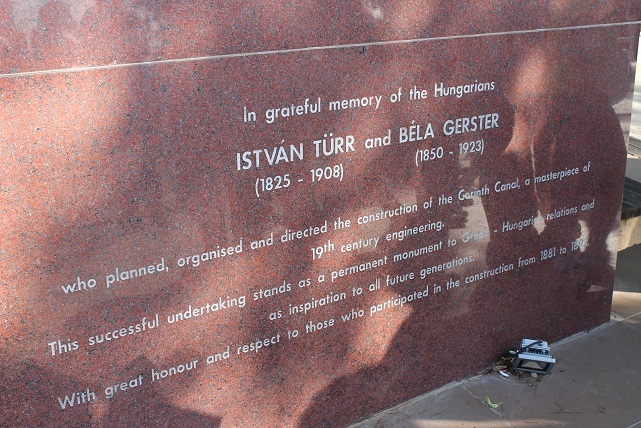 On the mainland side is this monument in Greek, Hungarian and English. 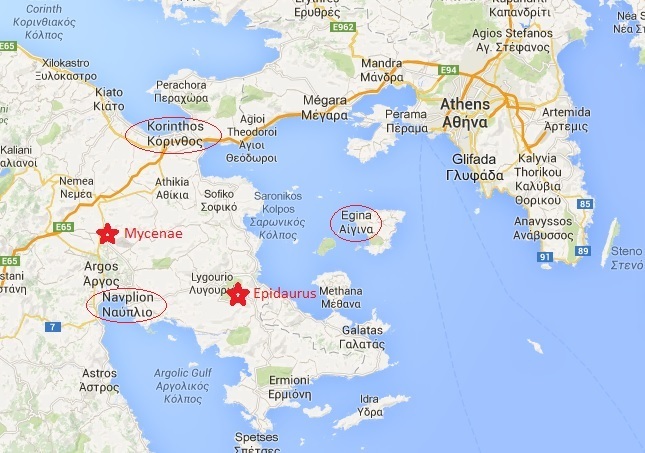 Sparta is on this (now) island, quite a ways further south. We followed the eastern shore. 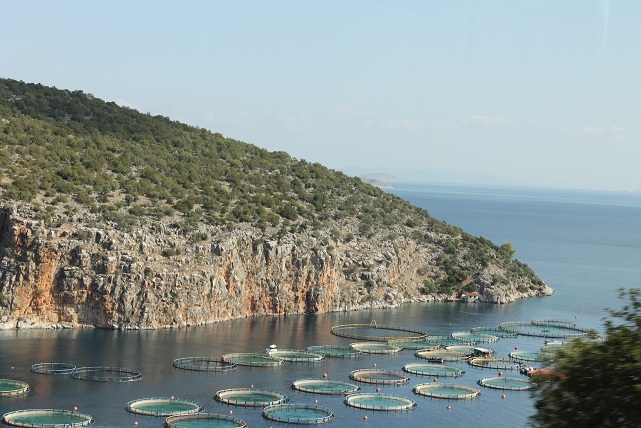 Here is a small bay with fish farms. 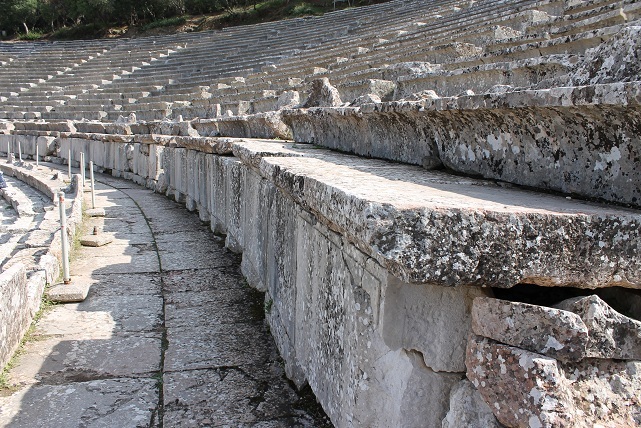 But its biggest claim to fame is its theater, almost perfectly preserved, and the acoustics still work! Many people were there, and they’d stand on the white circle and clap their hands (hearing the peculiar echo), or even give a short speech, in the knowledge that those who were seated could hear them. I was standing next to someone from India, and couldn’t resist. “I’m going to annoy the Brits,” and I launched into “We hold these truths to be self evident, that all men are create equal, that they are endowed by their creator with certain inalienable rights, that among these are life, liberty and the pursuit of happiness.” (Alas I couldn’t quite remember the truly firebrand sentence or two that follow that passage.) The man from India recognized it and cheered. I guess there is still some ill feeling towards the UK in India. I admit I stumbled over the words enough that I’m glad no one was making a movie of it. Here’s a detail of the seating. 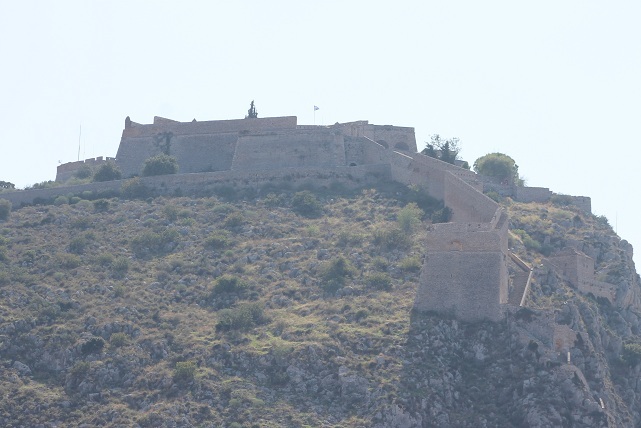 Next was a very brief stop at Nafplio. 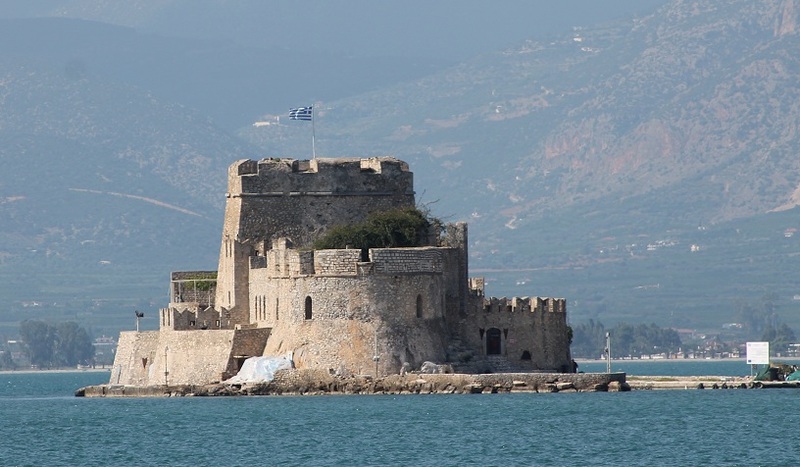 This was heavily fortified about the time of the Renaissance, and later, became the first capital of the modern Greek state. This was a “target of opportunity” for my camera. 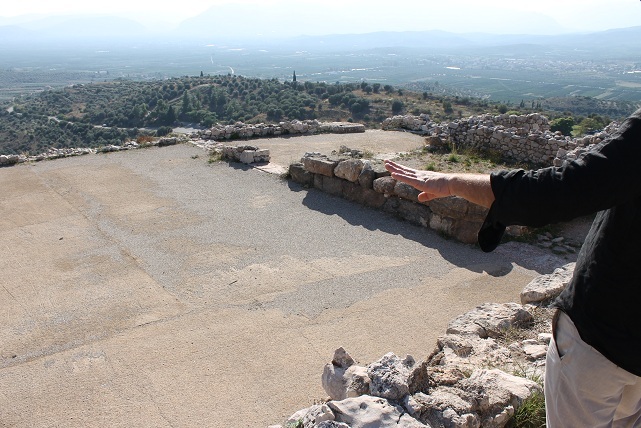 This is a Mycenean Greek ruin, the city of Tiryns. According to at least one version of the legend, it is the birthplace of Herakles (Hercules), a very important figure in myth (and I believe there is a movie coming out about him soon, too). We didn’t even stop here but our guide told us what it was and why it was significant. The picture is a bit blurry from being taken out the window of the bus. And now, off to Mycenae. Up to now most of what I’ve seen on this trip has been “newer” than 300 BCE, with a few things from the 500s thrown in. Now for stuff a thousand years older. 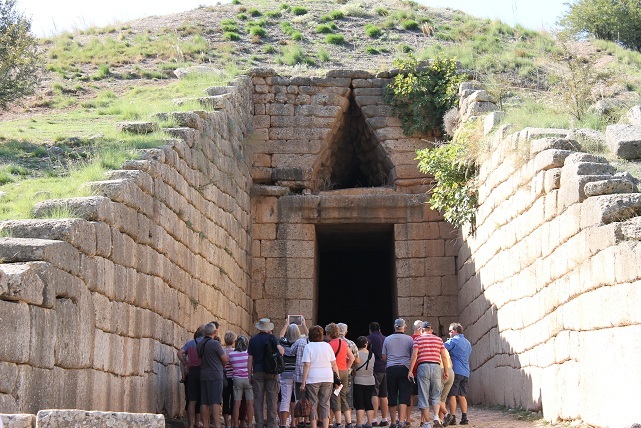 Mycenae is, as near as we can tell, the prehistoric capital of Greece. 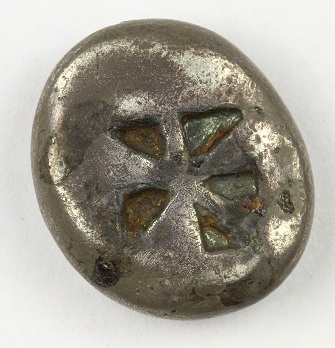 The bronze age Greeks had a heavily militarized, centralized, perhaps feudal state, not a bunch of independent city-states like Classical (Iron Age) Greece did in the 500s and 400s. It was the bronze age Greeks that fought the Trojan War, and many of the myths (the stories of Orestes, Perseus, Theseus, etc.) are set in this era, approximately 1600-1500 BCE. The Myceneans conquered the Cretan civilization, then about 1200 BCE, every civilization in the Mediterranean and Near East collapsed. Hard. And we aren’t sure why. 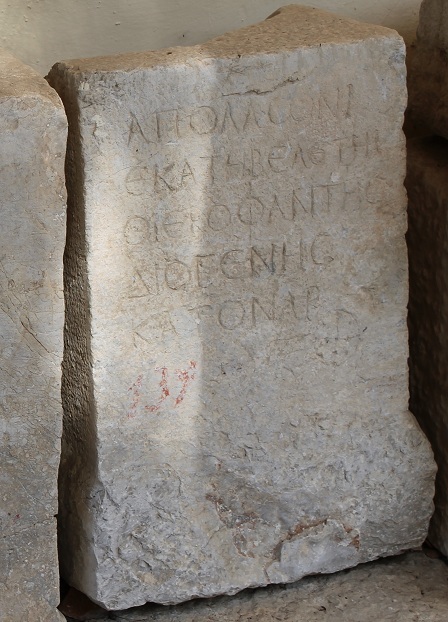 The Greeks even forgot how to write. We don’t have a lot of words from these people. I called them prehistoric a couple of paragraphs ago. That’s not much of an exaggeration. Although we can read their writing (in a script called “Linear B”), and can tell they spoke a very old form of Greek, the writing itself is nothing but tax records! We have no histories, no lists of kings… we don’t know if there really was a king named Agamemnon. 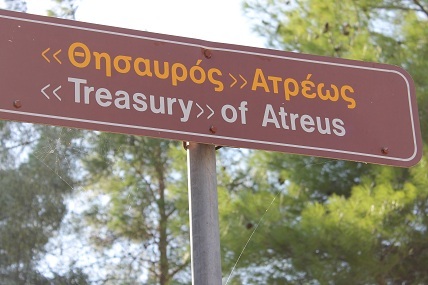 The “Treasury of Atreus” is a fanciful name given to it by the archaeologists who first dug these places up. 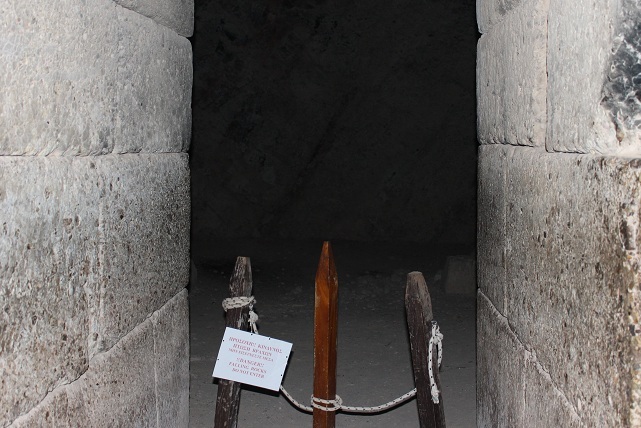 It almost certainly was a tomb, not a treasury. Even the sign expresses some skepticism. Prepare to be amazed at what people could do 3500 years ago with nothing but muscle power. Note the triangular opening above the flat lintel over the main doorway. Actually, that’s a key part of the structure; the flat lintel is actually cosmetic. The triangular archway carries the load around the doorway. 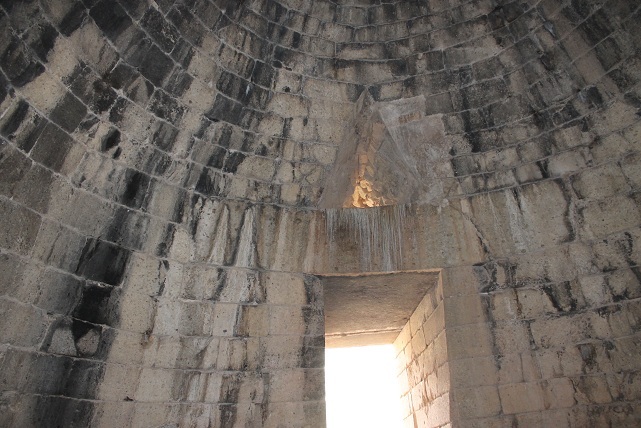 Probably, the doorway had some purely decorative (and light) item filling the triangular hole, to put as little weight as possible on that lintel. (You’ll see what I mean shortly.) Stone does not do well with shear stresses. From inside, looking back out the door. A shot at the very igloo-like dome. One of the few times I have really felt the need for a flash; it was pretty dark in there. For some reason there is this chamber off to the side. And here I am, leaving. I had better not get too fond of that hat. 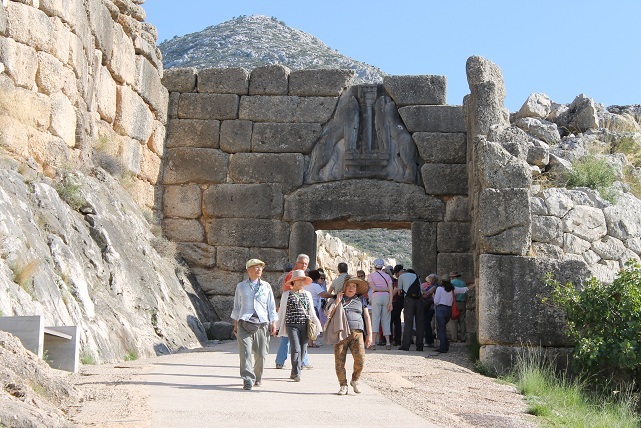 Now time to go to Mycenae proper. 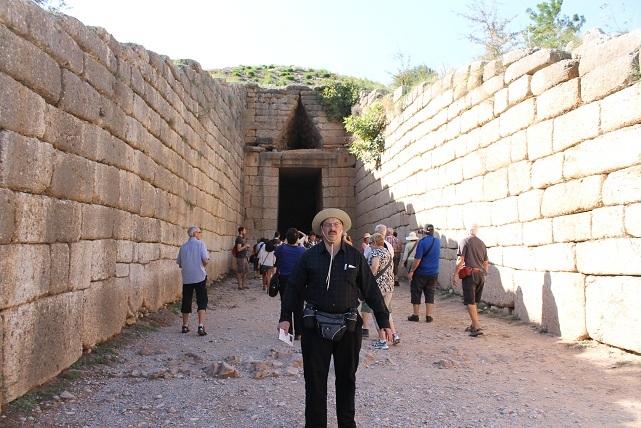 Our guide announced that we were about to undertake an assault on Mycenae. The approach to the main gate. And here it is, the famous Lion’s Gate. 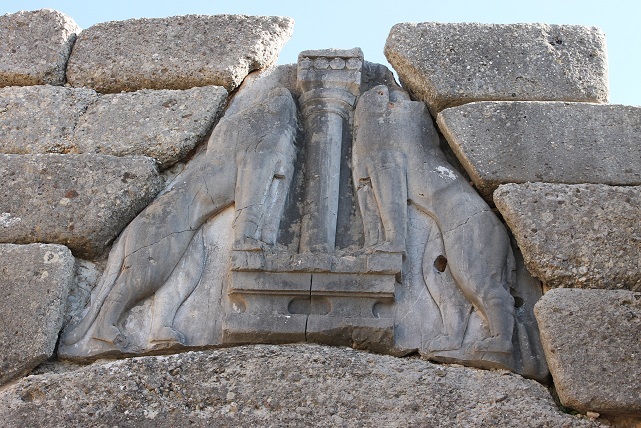 Note that it too is a triangular relieving arch over a flat lintel, but the triangle is filled in with the much lighter lion sculpture. The Lions Gate is iconic (it’s yet another thing I have known about since I was a kid), and deserves a closeup, even if the heads are missing. Approaching this gate as an attacker, you’d have things rained down on you from the high tower built to the right. Presumably, you’d be right handed, your shield in your left hand, unable to defend you from rocks (and worse) falling on you from the right. Our guide asked the group if anyone was left handed. Apparently I was the only one out of about fifteen people who was. He informed us that I’d probably have been sent at the gate because I could use my right hand to hold the shield. So as we walked through, I pretended my hat was a shield, put my right forearm through the strap and held it overhead. He told me I had it about right. 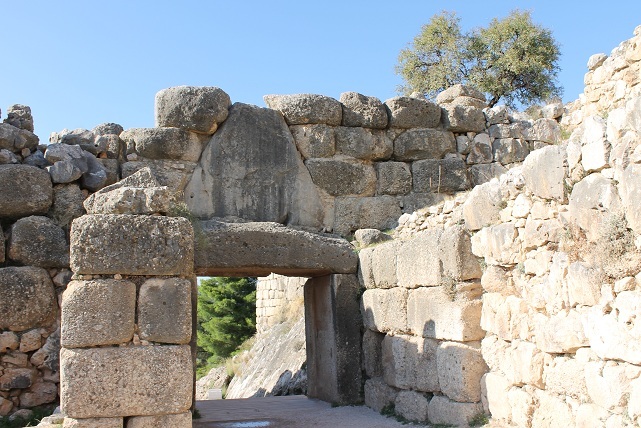 Once through the gates, there are various ruined areas, including burial pits in which the famous “Mask of Agamemnon” was found. It can’t be Agamemnon’s mask, however. 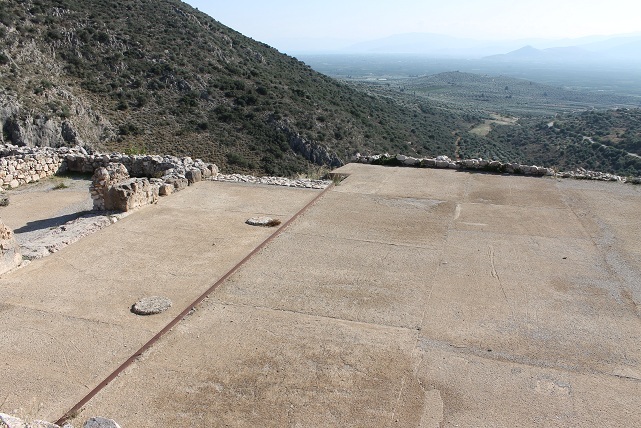 If Agamemnon was real, he lived in the 1200s BC and the burials are dated to the 1600s. After more climbing, we get to something a bit less morbid. 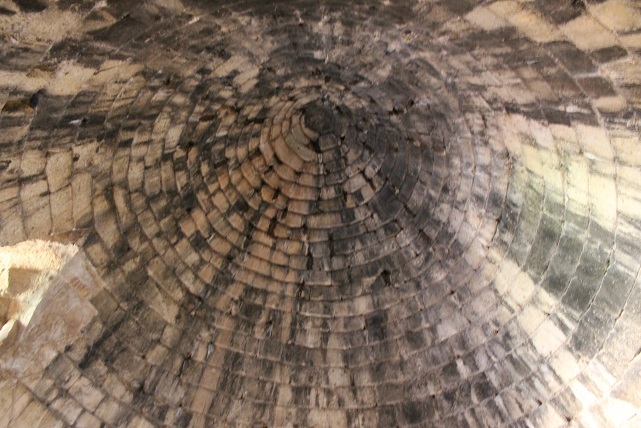 The following pictures are of the floor of the palace. 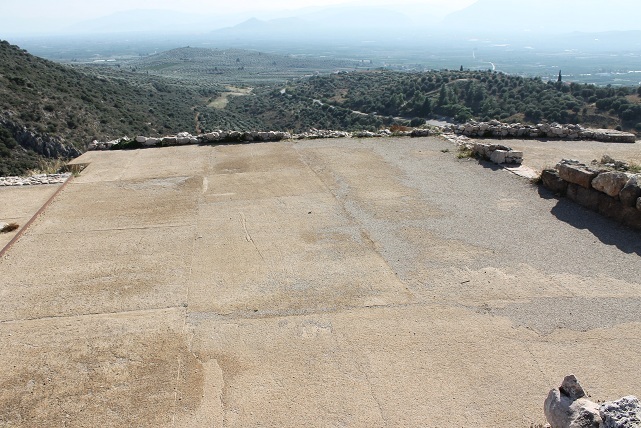 I panned over this boring-looking thing, because it has been rather whimsically described as the place where the Trojan War was planned. This is, after all the palace that ruled all of the Achaians Assuming Homer’s account is at all accurate. 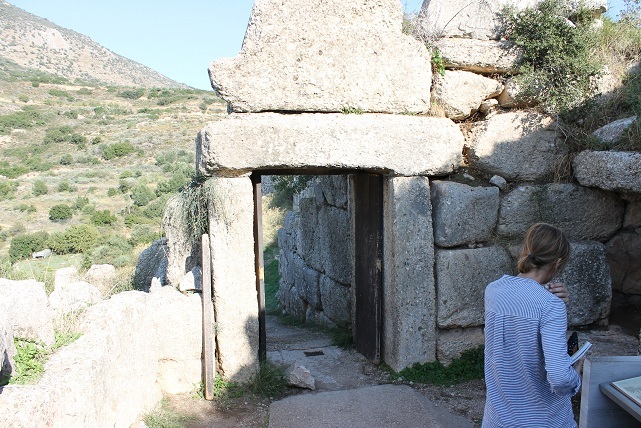 Walking further up, then down another path, you can see one of the smaller gates, this is the North Postern Gate. I couldn’t resist heading back through the Lions Gate, and getting a shot of it from behind. From here it’s much more apparent that the lions themselves are made out of a different (presumably lighter) material than the Cyclopean blocks of the walls. On the way back, I took this picture. Athens and Megara. Places that I had heard of since I was a kid, on street signs! I should have taken one of Corinth too, but didn’t think of it. 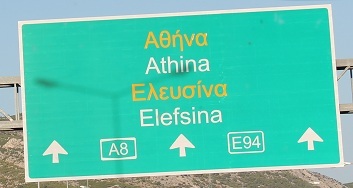 Elefsina (Elusina) also appeared a couple of times. 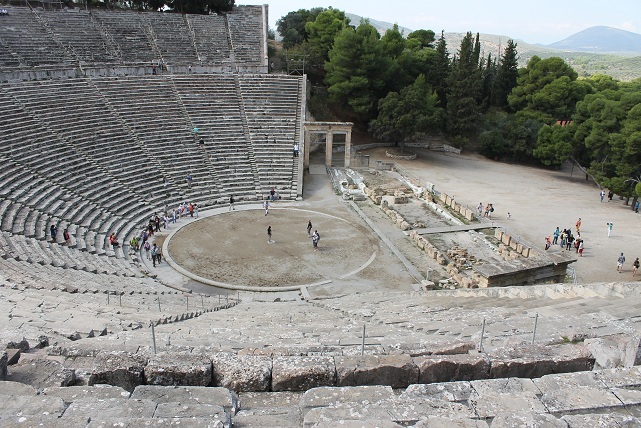 That was the one place of religious significance in Attica that drew visitors, being the home of the Eleusinian Mysteries. Ironically, even though I had spent the previous evening and this morning in Athens, I had not caught sight of the Acropolis. But here it was, on the way back. I’ll get to this soon enough! But my next step is to get to the Piraeus (yet another Name I Have Heard Since…) on the subway (!) 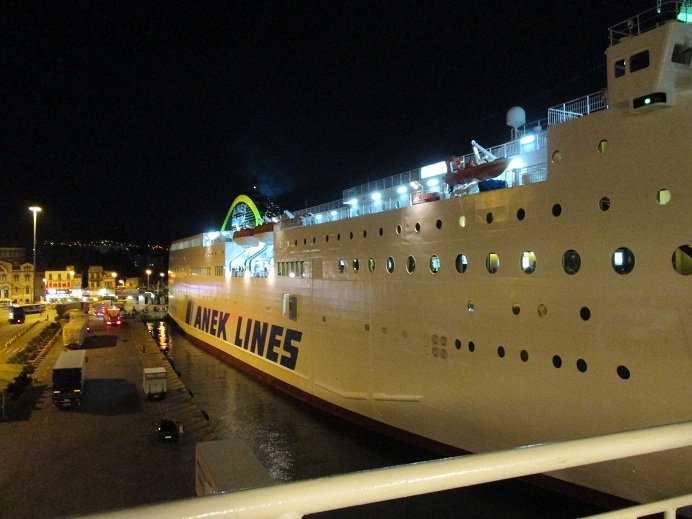 and take a ferry to Heraklion, in Crete. It left at 9 PM and arrived at 6PM. It’s like a mini cruise ship, with cabins, a restaurant, and so on. Many, however, choose to buy just a “pullman” large seat, arrayed like on an airliner, only with much more legroom and armroom. I took this picture from the upper deck of my ship, you’ll see Anek Lines (hmm, Latin characters–I was surprised to see a lot of instances of Latin-characters-only here), a competitor to the line I took, and you get a notion of how big the ferries are. The bottom half held trailers and cars; I watched for quite some time as tractor trailers backed in, uncoupled, and tractors drove off the ferry to pick up their next trailer. About this time, I noticed that my hat, which had been faithfully shielding my head from the Mediterranean sun, and absorbing the sweat I’ve been putting out as I tramp all over the place, was gone. I evidently left it in a metro station in downtown Athens, and it never turned up at lost and found. Someone is enjoying it. It’s a good hat, even if not a color match for my outfits. It did both its jobs well, being loosely based on an Aussie design (smart blokes, them Aussies). I was unable to find a suitable replacement.